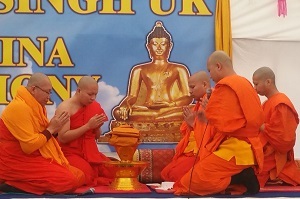 Runcorn, UK -- Hundreds of Buddhists descended on Wat Phra Singh temple on High Street in Runcorn to celebrate the Kathina festival. Jenny Stubbs, volunteer, the crowd was estimated to be in excess of 500 visitors from across the UK. She said: “As always, we offered free food to reciprocate the kindness and generosity we continually receive. “Kathina is a Buddhist festival which comes at the end of the rainy season retreat for Theravada Buddhists.